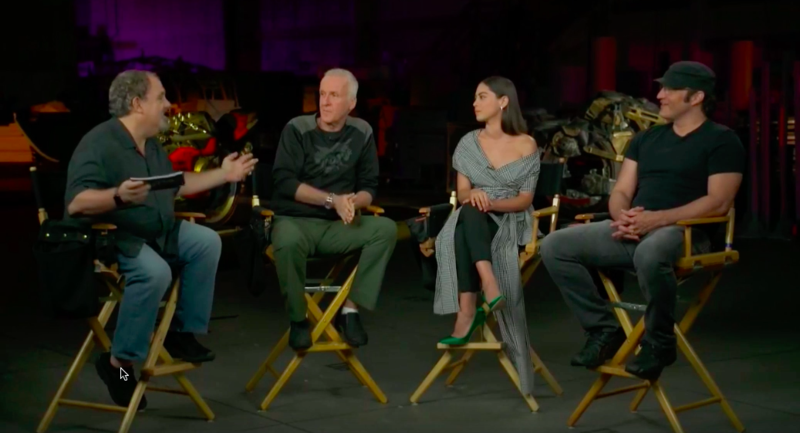 We talk to Robert Rodriguez and Jon Landau about Alita Battle Angel ……. After winning eleven Oscars for 1997’s Titanic director James Cameron was looking for a new project and was introduced to the world of manga specifically Yukito Kishiro’s epic ‘Alita Battle Angel’ graphic novels and its story of a disembodied ‘core’ that’s awoken in a post apocalyptic world with no memory of her past. Discovered by a Dr Ido who restores her robot body she begins to recall an extraordinary past that will effect the new skills she has acquired. 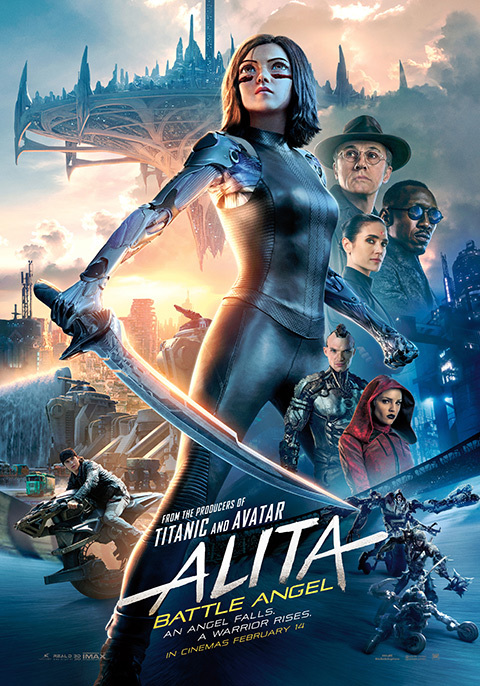 Cameron’s script for Alita Battle Angel was to be too far ahead of its time for the technology available and instead he went off to write and direct Avatar. 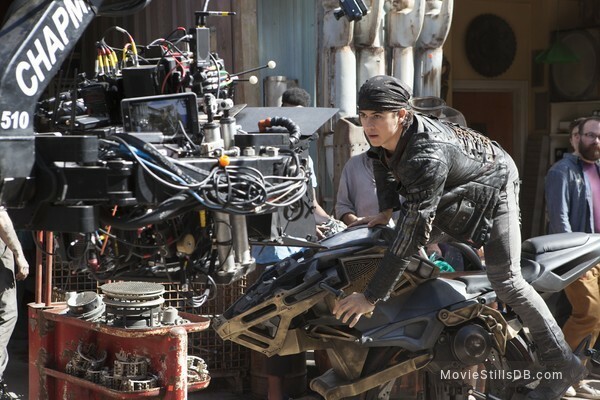 It was only in passing that director Robert Rodriguez was made aware of the script and for the first time Cameron passed his initial script to him to direct. An immense undertaking the film would be Rodriguez biggest ever project costing $200m and would be produced Jon Landau, himself no stranger to huge budgets having produced both Titanic and Avatar. Whilst they were in London we spoke to them both about the film. 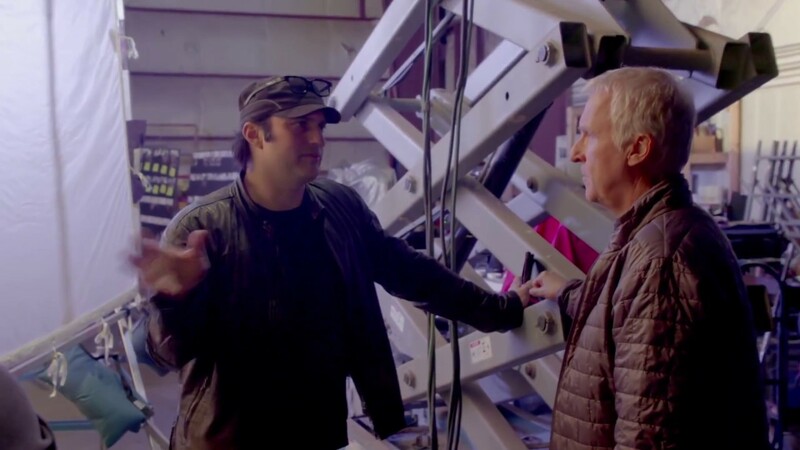 Jon Landau, a large guy with twinkly eyes and a ready laugh and Robert Rodriguez, tall and relaxed, dressed all in black and for once not wearing his trademark cowboy hat were only to keen to talk about Alita Battle Angel……. John Landau; I don’t focus on the cost, I focus on the story and Jim wrote such a strong script to start with from such strong material it was just a case of ‘How do we do this as cost effectively as possible?’ It’s funny because we’re the one business in the world where it doesn’t charge the consumer more for more because it doesn’t really matter what our movies cost you still pay the same thing when you go to a movie so to me this was about delivering a movie that exceeds the audiences expectations. That’s my objective. I: But surely both for you and yourself Robert when you’re writing it you know it’s going to be very expensive. JL: We know it’s not going to be cheap going in. Case in point : we know Alita is going to be expensive. We decide to make the movie in Robert’s back yard in Austin Texas because that’s going to be the most efficient way to make the movie. Had we made the movie in Los Angeles the cost for live action would have gone up by 20 -30%. 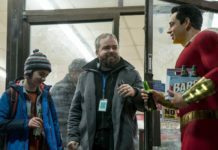 By doing it in Austin we’re working with a crew that Robert’s familiar with, there’s a tax incentive by the state to be there and it’s the biggest movie and set construction that’s happened there in a long time in Texas so we had to be smart about how we do it without compromising the film. AGF: I understand James script was enormously long but in terms of the final script how did you collaborate with him in cutting it down to a manageable length? Robert Rodriguez: His first stab at writing the story himself was about 186 pages and then he went and worked with another writer and did a new script that had some of those elements and it was shorter and more like a shooting script but when he compared them he really liked that first stab that he took and that was what really drew him to the story and I was interested in reading that so I was curious , “if that’s got all the stuff that he loves in it maybe it just needs to be cut down’ Maybe I know how to do that because I’m an editor too. So when I read it, it was just fantastic and yeah it was long it was a big saga. He never did cut it down himself he just wrote and then moved on so I took it and don’t even pay me because I’m gonna try and take 60 pages out of this if I can without you even noticing what I took out and I did! (laughs). AGF: Did he notice ? RR: Well he kinda knew but he didn’t miss. He said, ‘I played a game with myself Robert. So every few pages I thought, ‘oh he ‘s going to cut my favourite scene’’ and he got all the way to the end without me cutting his favourite scenes. He said ‘I don’t know how you sweated 60 pages out of this’. RR: No not initially. He said one thing, ‘When they’re on the motorcycle put that back in because that’s me channeling the teenage girl in me and that made me a lot of money in Titanic’. So I actually made more of the ride. I added more to that when he explained why it was there. I was just trying to find things to cut down and preserve as many of the big moments but then he says, ‘They’re character moments. It’s not the big moments or the fighting it’s those character moments that are going to make the relationship work’ so he’s always on point. JL: What told us that Robert was really the right person was when he delivered back these edited scripts because you don’t rewrite Jim Cameron. But he edited it and he didn’t lose the heart that Jim had or the themes and that’s what really convinced us that Robert was the right guy to partner with us. 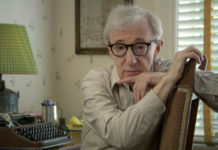 AGF: Robert you do everything on your films: produce, direct, write, act as cinematographer, edit, compose the music and you’ve not done a lot of these things on Alita Battle Angel. RR: Well you don’t really drop them Simon, you bring on much more experienced people. What’s nice about doing those jobs is that it makes it easier to communicate with them so you know something’s wrong with the light maybe bring in a 10Kw or let’s bounce the light here because it feels too artificial. You can communicate with them better. RR: The reason I do all those jobs is to put as much money on the screen as possible. It’s not that I think I’m better at those jobs it’s just that I can’t always afford to have a full crew or to hire that composer that I would love to work with, you know, Hans Zimmer someday. Well this movie was that movie so we were able to attract these star payers because of Jim which I’d never get to work with so I loved it I embraced it. You know if I tried to operate the camera on this well, good luck, because it’s a big system on a3D rig and crane and there’s three operators so which one would I be? So it freed me up a lot and there’s a lot of moving parts in this that aren’t in my normal movies. AGF: James Cameron’s film always up the ante in some way. 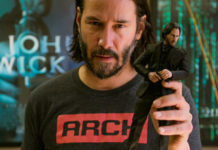 What’s he bringing to the screen with Alita Battle Angel? JL: I think the idea of taking a human looking CG character and integrating them seamlessly into photographic scenes opposite Christoph Waltz, opposite Jennifer Connolly where they’re not separated by this invisible line of special effects but where they’re touching and feeling and holding. That’s never been done before. AGF: The eyes for virtual reality / CGI characters have always been their downfall in films to date as they’re not believable. Has that been the most difficult part of Alita Battle Angel? JL: Let me just touch on that. 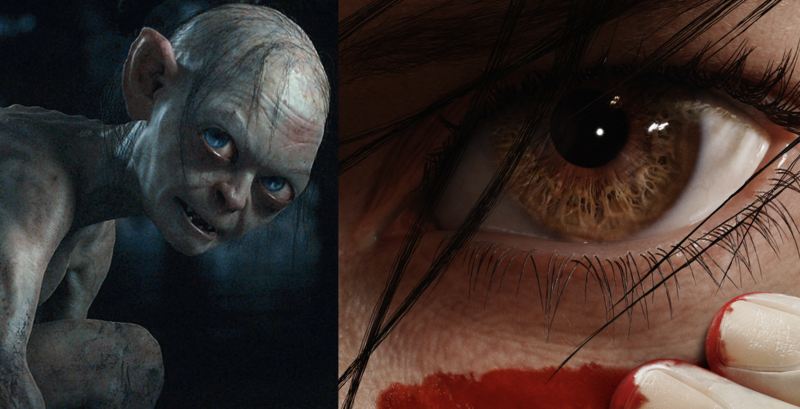 WETA (special effects company) will tell you that they have more detail in Alita’s eye than they have in all of Gollum. Think about that. ALL of Gollum! RR: (laughs) They love those sort of facts. The eyes are the window of the soul an when you get that close up and the eyes are that large it feels more human than human. AGF: Now the eyes in the second trailer seemed a lot smaller than the first trailer. RR: Yeah they’re actually bigger. We had to make a trailer pretty quickly and whatever we put in there was not the final shot yet so it was going to change anyway. We’re still refining the look but people were wondering what Jim would say, ‘You know the eyes are always going to look wrong they actually have to be bigger. The irises are too small. The eye size is fine I’m telling you I’ve been there before with Avatar. Got to make the irises bigger. Doesn’t matter what size the eyes are they’ll all feel too big if the irises aren’t proportionally bigger, so increase them by 30%’. I said ‘30%! You can maybe get away with 18-20%’ So we tried it and that’s what did it. People compare it and they’re looking right at it and think they’re smaller but they’re not. AGF: So was that the biggest challenge? RR: So imagine just figuring that out, now we’ve got to figure out everything else too. So across the board you know it’s going to be a challenge but it’s not easy but we knew we were going to figure it all out. It’s just about starting to build the face then the eyes then the body then putting it into the scenes and that’s where you see where it’s not working in different light and angles and you adjust it. It’s like you keep rebuilding a car and you test drive and then you keep making adjustments. JL: Well you don’t think about that from a challenge stand point. You get a hint of it in that scene you saw where she eats an orange. Well there’s another scene where she eats chocolate. Now that is harder than the motorball (a brutal game played on roller blades in the film)because she’s biting into it and how does the lip react to it and push against it and gets on her lips and moisture on the chocolate bar. Not only does she bite it once but she bites it four times! RR: And her face is shaped differently to a human face but you just start believing it because she looks so real so it works differently from a regular person. AGF: Robert you mentioned about trailers but you have a habit of shooting moments specifically for the trailers that never appear in the film. AGF: Have you done that with Alita Battle Angel? RR: Yes I had lines in there in fact a lot of the lines that were in that second trailer were lines that I added to the script that will never be in the movie. Like she says, ‘Sometimes not remembering who you are is the loneliest feeling’. That was a line that said everything about that whole first act and it’s not in the movie but the marketing department grabbed it because they’d seen it in the rough cut and it’s going to take the whole movie to talk about. 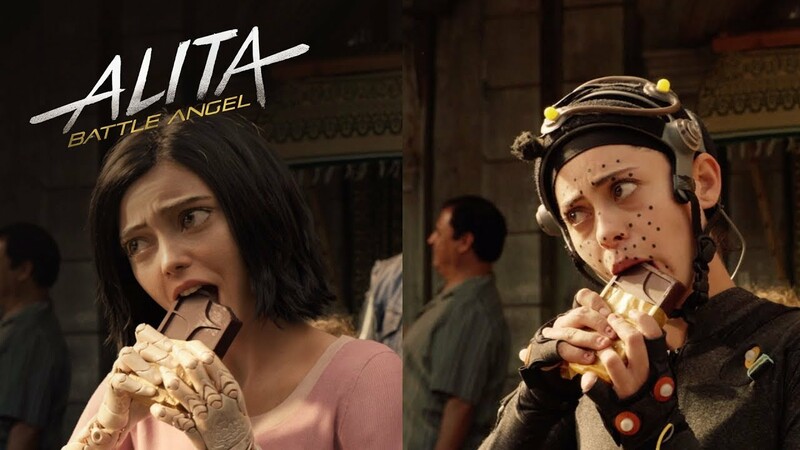 AGF: Rosa Salazar is Alita Battle Angel. Now this is a huge film for her. How did you audition them for a film like this? RR: Rosa trained for months, really hard. JL: We cast her in May 2016 and we didn’t start principal photography until October. She went to martial arts training, roller blade training, physical fitness, movement all of these different things and her agent came to her in early August with an opportunity to do a two week gig on a film in Italy and he called me up and said, ‘Before I go to Rosa would you guys be OK working around that?’ and we said, ‘Well look we’re not going to prevent her’. So he called up Rosa she says, ‘NO! I’m in this Alita and I’m in this head space. I don’t want to break away from my training’ and she turned down this other role. AGF: James Cameron has an image of being very single minded but when he handed this over was there any conflict about how you wanted to do it? RR: No, no I really wanted to make this in the style of a Jim Cameron movie. He wanted to see this movie like forever but he wasn’t going to get to make it so I know his work so well and the script was so clear that it was directed already but I thought that like I did with ‘Sin City’, a Frank Miller movie come to life I would make this Jim Cameron thing come to life with all the stuff I’ve learnt over the years. The style that I move towards is Jim Cameron-esque because I learnt from him and his films. I look back at my movies and say, ‘Oh I stole that shot from The Terminator’. I was so inspired by his stuff so this was a chance to learn. AGF: I’d heard there was a difference of opinion about one character’s face coming off. RR: Oh yeah, Jim said, ‘I always pictured …..’ Well I learnt that with Quentin (Tarantino) too on Dusk til Dawn. I said, ‘Hey what do you think of our liquor store? And he was looking around the set and said, ‘This room is all wrong! The liquor shelves are meant to be this high…… ‘Well it didn’t say that in the script’…. ‘Yes it did…oh well that’s what was in my head when I wrote it’.(laughs). Sometimes it’s not in the script and Jim said he’d always pictured it like this. So I said, ‘Well I’d always pictured it like this!’ So Jim said, ‘Well show it to me. Why don’t you go mock it up and show it to me?’. He’s very much like that. He’s not, you know, it’s this way or that! He let me prove if my way worked or not. But if he said he preferred his way then I would just go with his because he’s been around longer and knows what’s round the corner. He can predict things that you wouldn’t you like with the irises being bigger. I trust him and he’s right. He’s right about a lot of things. You know if you want to go dive in the ocean no matter what grade you are, if you’re in a submarine with Jim and he says, ‘I think we should jettison these packs or we’re going to implode ‘ you go, ‘Yeah sounds good to me!’(laughs). He’s been there. The guy knows. JL: What Jim also knows on each film that he directs is that every film needs a director to be the final decision maker but film making is also a collaborative effort so when we have a film maker like Robert directing it’s our obligation to bring to him things that we might not see. When Jim brings up something about a face falling off or the irises it’s not as a mandate it’s as a collaborator to end up with the best result. AGF: There’s plenty of Alita Battle Angel stories, is there a sequel ready to start shooting? JL: If the audience tells us there is. RR: Plenty of stories but you can’t have these things in a vacuum. The audience have got to want it. AGF: Finally Jon as the producer of the upcoming Avatar films when can we expect a first glimpse? JL: Aaahhh we’ve not even talked about that yet, Simon. We work in a very different process than other films because when we’re done with our filming we still don’t have any material that we can show. We tend to go through the process of visual effects and I described on the first Avatar that we turned it over to WETA and just like birthing a child it took nine months to see a first shot back so we’re right now in labour. Secretive scripts especially the one for ‘Blade Runner 2049’……..